You guys. Look at all the pretty things! 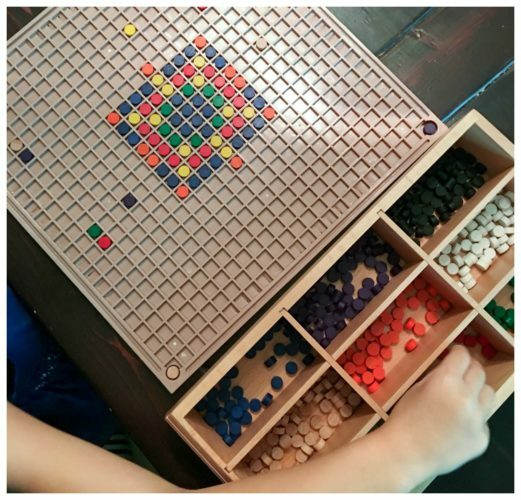 My type-A personality has been drooling over this Spielgaben set for years- ever since I saw it mentioned on one of my favorite homeschool blogger’s sites. All the beautiful wooden pieces. The rainbow colors. The lovely storage box. I can’t help myself. I’m like a moth to the perfectly organized flame. I was not disappointed when my Spielgaben set arrived. This thing is BIG and heavy and I had to wait for my husband to get home from work to help me get it out of the box. I probably could have done it, but I was sure I would somehow end up thumping it or bumping it or somehow put a dent into it. Anyways- the point it, we are now the new proud owners of a Spielgaben set. I wanted it for Little Miss, who is officially a Kindergarten this year. 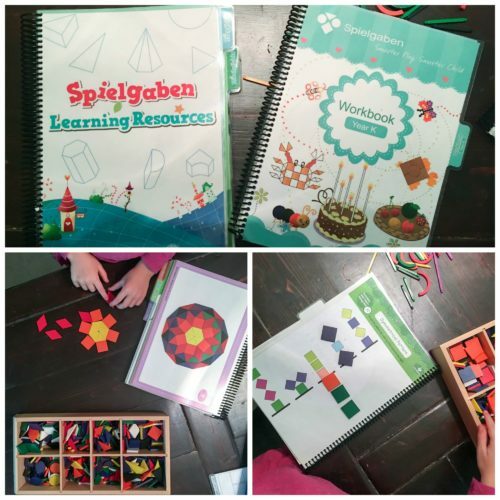 Spielgaben has a wonderful workbook just for Kindergarteners with tons of activities for her to do throughout the year- everything from addition and subtraction to fractions and symmetry and spatial awareness. She’s also explored letters and words and has used the pieces to spell her name, and my name, and any other name she can think of. We’ve used them to build the weather (a cloud here, a sun there). We’ve used them to practice patterning, and to build pretty pictures during read aloud time. We’ve barely dipped our toes into all the things that we can do with this set. I was thrilled (surprised? excited? ALL THE THINGS) that I could also use it with my older kids. Doodle, who attends therapy for his alphabet soup of special needs has been loving this. He has been using the pieces to reinforce math skills, building three-dimensional shapes and exploring fractions. I love the pattern board for him- he’s working on fine motor skills to place the little circles in the grids, and he’s working on his hand strength while building shapes. We’ve even found this set to be useful for our almost-middle-schooler. 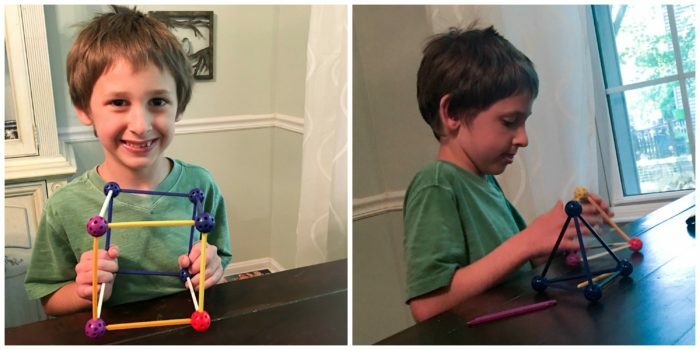 He is taking chemistry this year, and spent an evening with his dad, looking up different kinds of molecules, and building them together. It amazes me that one product can be used for all my kids, for many different subjects. Our Spielgaben set is going to hang out in a place of honor in our school room, and I plan on tying it into our lessons as much as possible this year. I’m still going through all the curriculum guides and idea books that came with the set, and am planning out where and when we can use the pieces, but I already know it’s going to be ALL THE TIME. I plan on using it with Little Miss as part of her kindergarten curriculum on a daily basis, and working with Doodle a few times a week. He’ll also be using it for free play all the time because of the added benefit of motor skills practice – he’s the kind of kid who loves to build and has the imagination to really enjoy building and creating with these pieces. Now, I wouldn’t just come on here to wax poetic about this set if I couldn’t offer one lucky reader a chance to win their own. I know that Spielgaben is an investment, and it may not be in the budget for all of you- but, if it is something you have been considering saving up for, I would highly recommend it. Spielgaben has graciously offered one set to giveaway- so please use the widget below to enter to win! Spielgaben is also putting together a fabulous discount for my readers- all you need to do is visit this page and fill out the form, and they’ll set you up with a coupon code when the giveaway is over! Did you print and bind the work books on your own? Would love to hear how you put them together! I took mine to get spiral bound at the UPS store. It’s not terribly expensive to do, and was worth it to keep them organized! I have never heard of them. Facebook led me to your blog and I am glad to learn about both. I would adore this set if we won. Thank you! I have heard of these sets before — I would love to win one! We have been homeschooling for 9 years and counting now, and have never heard of this. It looks amazing! What a way to neatly have so much at your fingertips to foster creativity and imagination! Love it! I’ve heard of Spielgaban before and it looks like a TON of learning fun. Oh wow, oh wow, oh wow!! I have never heard of Spielgaben before, but it probably is for the better since I would have been ogling over it forever! haha. Fingers, eyes, and toes crossed! This would be such a fun blessing for our homeschool family! I have never heard of this before, but it looks awesome! This looks like something I used to play with as a child but I do not remember the name of it! I have heard of Spielbagen but never seen any materials in person. WOW! I have four children and there would be something for everyone for years to come! I have drooled over spielgaben many a time, but it’s always been out of budget. It’s beautiful and exactly the time of activity I encourage for early elementary “lessons” in our homeschool. I’ve never heard of this. It looks like so much fun! I have heard of it from Confessions of a Homeschooler’s website. Have wanted one for so long!!! Would love to use with my four girls! I’ve never heard of it before but it seems like an amazing addition to our curriculum! I’ve never seen this before now. I love it! I’ve never seen such a thing. Seems like it would be a great addition to have at home. A great manipulative for sure. This would be so awesome to win! I’ve heard of it before and thought it sounded so neat! Love, love, love these! These would definitely find a place of honor in my homeschool room! I’ve been drooling over this set for a while! I’ve never heard of this set before but it looks absolutely amazing! It would be a blessing for whoever wins it I’m sure. I have never heard of this company before but what a beautiful learning aid. I seen a little bit about them on another website, but they were using for a toddler. Much more interested in these now that I see how an older child could use these. Do you know if they have guides for ways to use for older than Kindergarten? I have been wanting to get a set of these, but couldn’t justify the cost right now. I’m so excited for this opportunity. Thanks! Yes, I have heard of Spielgaben. It has been on my wish list for the past 4 years. We are about to begin our homeschool adventure and i have been eyeing this for about a year now! I’ve never heard of this, it looks amazing! I never heard of it, what a great concept! I have not heard of them. But it looks awesome. And I have a toddler that I think would absolutely go nuts over this! I’ve heard of Speilgaben & always wondered if it was worth the price. Now I’m convinced! Yes, I have heard of Spielgaben before. It looks amazing! Thank you! I have never heard of them, but I am very interested now! Yes, I saw it on a homeschool blog and would LOVE to own a set. It is truly out of our budget, so my only hope is to win one! Yes, I’ve heard of them. I’ve seen other reviews of them and have wanted a set for years. This would be great for my 5 and 3 years olds, but I’m sure my 9 year old would play with it too. I have heard of them before on another homeschool blog. I’ve wanted a set for a while now. Yes, and I’ve been wishing for one for the longest time! I have heard of it, but the price was too high for us. Looks like something my kids would love. I have not heard of them before but I definitely want to check them out for my kids!!!! No, I haven’t heard of it. I like it, though! I have seen them one other time on a home schooling website but have never seen them in person. They seem super neat! I don’t think I’ve heard of it, but I’ve seen similar pieces being used in a video about German Kindergarten and it intrigued me. I have three kids and I think it would be excellent, especially for my kindergarten-aged child. Looks like a great resource. Seen it before . I have heard of these before and they look so awesome and so useful for so many things! I’d never heard of this before but it looks awesome! I have never heard of these, but they look amazing! I’m sure my 7-, 5- and 2-yr-old would love it! I have never heard of them but it looks awesome! I have wanted one of these for a while now, I think it would be perfect for my autistic son. I’ve seen these before. I really really want a set. I have 8 kids and I could see everyone using it. I’d especially like it for my son with DS…. Which is how I found it a couple of years ago because it was recommended for children with Down Syndrome. Way out of my price range though. Ive never heard of the name but Ive seen similar toys. THIS WOULD BE AMAZING FOR MY PRESCHOOLER. No, i have never heard of Speilgaban before, but it looks like a ton of fun! No, I have never heard of it before, but looks AWESOME! I have never heard of these, but they look so hands on!. My two would love these! I have never heard of them before! No I have never heard of this before, but I know my sons would love this set! It has been several years, but I have heard of Spielgaben. I have never heard of this before, but looks amazing!!! I’ve never heard of this. Btw, the giveaway widget has not been working on my phone, so I’m trying on my laptop and it’s still glitchy. I hope this goes through this time. I have had my eye on this set for about a year now. Have been trying to figure out a way to fit it into the budget. What an awesome giveaway. I have heard of it and would LOVE a set for my almost 5 year old!!!!!! I’ve heard about spielgaben. I’ve never used it. I think it would be a great thing for my three young children. Thanks for the opportunity. I have never heard of these, but it looks like so much fun for kids and adults alike! I have never heard of this product before. As I read through the post and saw your pictures, this would be an awesome addition to my home school!! My boys love hands on activities!!!! This is such an amazing giveaway. I would love to have this for use with my homeschooling curriculum. There is no way I could ever purchase a set but wining this would spawn a whole new way to teach my son. No I haven’t heard of them before. I think it looks very fun and educational though. Thanks!! I’ve never heard of spielgaben before, but it looks awesome! I’ve been wanting to own a Spielgaben set for my kids. Thank you! No, I have never heard of it before but it looks like a lot of fun~! I have never heard of it – but looks amazing. Yes, I have heard of Spielgaben. I saw a fellow homeschooler’s blog showing examples of how they used it. I was fascinated with the curriculum and love the hands-on, visual approach. However, I visited the website, and there was no way we could afford it. Thank you for the opportunity to win this giveaway. This looks like an excellent way for children to learn. I’ve heard of Spielgaben for a couple of years now, possibly when it first came out. The concept is really intriguing, but the price point is a little steep. I have heard of this wonderful set! I’ve been dreaming about purchasing for a few years now, but it is a little too pricey for our budget. Maybe, someday I can save up enough. Thanks for the chance to win!! Oh my goodness, look at all the colors! What a fantastic set! Hours and hours of imaginative play on t the learning benefits! Yes, I have seen this before, thought it was amazing! I have never heard of these before but they would make a wonderful addition to our homeschool! I have never heard of Spielgaben before this review, but I am so intrigued! I would love to win this for my children, they are 7, 3, and 2 and I homeschool them! 🙂 This seems like a fantastic way to teach! I would probably be afraid of my kids messing it up too, lol! Yes I’ve heard about Spiegelben and is thrilled that there is a giveaway. This is an awesome visual learning tool with many pieces to use in many ways. I was so excited to see this. I always seem to miss other Spiegelven giveaways. I would love to have this set to teach my youngest daughter with. I just heard about spielgaben a few weeks ago and thought it sounded amazing! But I knew I could never afford it! Sure would be nice to win! Never heard of it! Sounds cool! Nope, I have not heard of them, but they look very interesting and helpful. I am definitely looking into them now! Thanks! i have heard of it in other posts. Never heard of Spielgaben before, but this set looks like a ton of fun! Yes I heard about them a few years ago. I’ve never heard of this, but it looks amazing! Yes, I have heard about it for years. I have been wanting it for so long!! I just don’t have it in my budget to afford it. Thanks for the opportunity to win! I’d never heard of Spielgaben! What a fun item! Thanks for the giveaway, and all the great ideas on how to use it! I read about it on http://www.1plus1plus1equals1.net/ a while ago and have been planning to buy it ever since, but so far we haven’t found a time when we can afford it. I have heard about Spielgaben before and have been wanting a set, but so far it has not been in the budget. I think it would be a wonderful resource! I haven’t heard of this set before, but it looks awesome! I had never heard of this until yesterday. Something similar showed up in my news feed yesterday. I Have heard of Spielgaben, a few years ago and have wanted a set ever since. I love how versatile it is. This is so cool I’ve never heard of them before!!! No, I’ve never heard of it before, but wow, does it look awesome! No I never heard of this before, It looks awesome!! I look at Spiegalban’s website occasionally, pining for this set. I know it’s well worth the investment but just not in our budget right now. Thanks for hosting a give-away! Never seen or heard of it before. It looks AMAZING! Yes I’ve heard of this program before! Would love to win it! Never heard of these but they look wonderful! No, I’ve never heard of it!! It looks wonderful!! I have never heard of this before. Looks like a lot of educational fun for my tactile learners. Thanks for the opportunity to enter and Blessings! I had not heard of this until my daughter sent me a link to their site. She home schools my Granddaughter and special needs Grandson. This is a great way to do ‘hands on – kinetic’ learning. All children can learn easily this way and for many children this is their primary way of learning which is why regular public school can be difficult for intelligent children. Public school tends to teach to the visual or audio learner. This is a must for every family that has a kinetic learner! This is the first I have heard of it, looks quite interesting! I have never heard of them, but they look awesome ! I have never heard of this before but now I am fascinated by it. I have heard of these but have never seen them personally. They look like great products for my boys as we start homeschooling. I have seen this in action on other sites. Have put on my wish list. Thanks for this wounderful chance to win. Ive drooled over these for years but we haven’t had it in our budget. They’re beautiful! I too have been drooling over this set ever since I saw it on another blog that I follow. I would love a chance to have this in our homeschool but it just isn’t in our budget for now. Thank you so much for this opportunity! This is the first I’ve heard about Spielgaben. I have never heard of this before. It looks like an amazing teaching tool . This is new to me. It looks fun! I’ve never heard of Spielgaben before. My daughter is very hands on, and this looks like something that would allow her to imagination to run wild! I love it! I actually have never heard of these before, thought it sounded like a German name. My daughter is very tactile and this type of learning would help her increase her potential for retention. It’s really beautiful as well. This is the first I’ve heard of it! I also am completely drawn in to the colours and many pieces with their designated spots! Yes, I have heard of it before on blogs. I think it looks really cool! So much fun and an awesome giveaway! I have been wanting to buy a set for my littles for a few years now, but it’s just never in the budget. Thank you for the opportunity to win this… would be such a blessing! Oh my does this look like fun! Never heard of Spielgaben but it’s definitely on my radar now! I’ve never seen this before. Looks like a lot of fun! I e wanted to try this for years but can not afford it! I have not heard of Spielgaben before but they look super cool, and I love them! New to me but how awesome! i have heard of them. they are amazing! I’ve wanted a set for a very long time!!! I’ve definitely heard of them before, but my budget is MUCH too tight for something like this! What a fantastic giveaway! I saw Spielgaben on another blog and have been eyeing it for a year,this will be a blessing to whomever the lucky winner is. Nope, I’ve never heard of Spielgaben. Wow! Does it look neat! I have not seen this set before. They look very versatile and sturdy. My 6 kids would love them! I have definitely heard of them before. I have always wanted a set for my children, but I cannot afford them. We would love to win this? Yes I have, it’s been on my dream list for a while now. Yep heard of it. Been wishing for a set for a long time. I’ve been looking at this set for a long time after seeing it on several blogs. I would love to have one! All my kids would love this! I had not heard of this before. It looks very high-quality and would be a lot of fun to have here! We have been looking at this for a while now. Thanks for the opportunity to win! Yes it have heard of this set before. I have dreamed for a couple of years of buying it for my kids but have never been able to afford it as we are always on a very tight budget. I have…at Carisa’s Blog: 1Plus1Plus1Equals1….It looks so cool! Thanks for the giveaway! I have seen this many times and would absolutely love to own one but it is way out of our budget. I would love to win one. I hadn’t heard of it, but it looks so interesting! And so pretty! Oh how I’ve dreamed of owning a set! I have seen them used on a blog and love the idea. 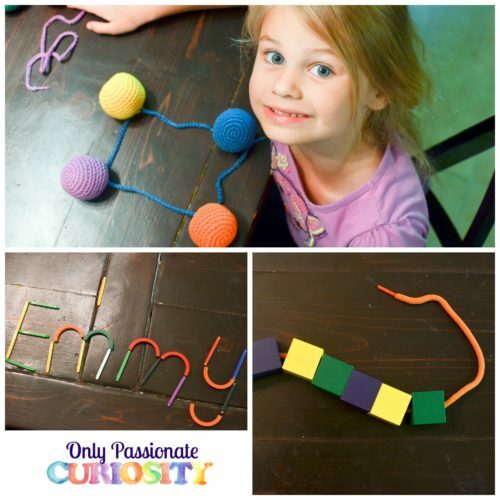 They would be perfect for using in homeschooling our 5 ages 5 and under! Thanks for a chance to win them! I have never heard of the company before this. I am so glad you are offering this giveaway! Okay. I have coveted these for years and come with a million ways that they can work for every kiddo! I never win but it is worth a shot! Thanks! Love your printables! I have never heard of this product before but it does look awesome. I haven’t heard of this set before, but it looks amazing! I’ve only heard of it once before, but it looks amazing! I haven’t heard of them before. I’ve seen Spielgaben featured on another blog and thought that it looked really interesting! Never heard of these before, but both my boys would go crazy over it!! This has been on my wish list for 3 years now. I think I’m more excited about having the activity booklet for the great activities. 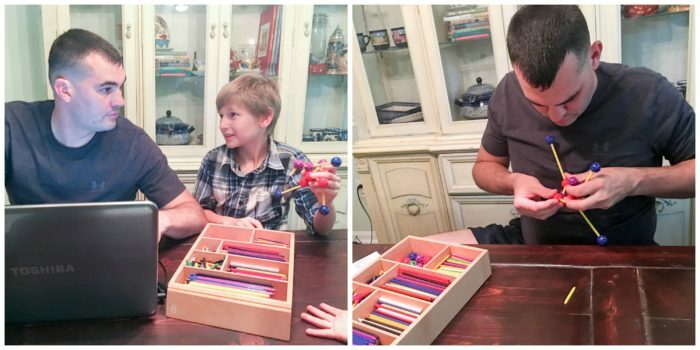 I have heard of the Spielgaben before and I would love to add this to my homeschool repertoire! I have never heard of this before! And I’m surprised it looks like such a great product! I’ve heard of Speigleban before, but NEVER had the money to purchase it. Thank you so much for the chance to win! Spielgaben sets are awesome. I have heard of the, but we have never been fortunate enough to have one of our own. I haven’t heard of them before, but oh, this set is gorgeous. I have never heard of it before. I am very intrigued! It looks amazing! Wow!~ I have never heard of them before – what a cool open ended collection of fun! I have heard of it, but could not afford a set. I would LOVE to own this! Haven’t heard of them before. I’ve neither seen nor heard of it before, but it looks like a lot of fun learning! This is such an amazing tool for learning! I love how open ended it is and that it can teach math skills for many years! I have heard of it, but haven’t used them before. I have never heard of them, but it looks really amazing!! This must be one of the best kept homeschool secrets I’ve ever seen. My kids would LOVE this. Why have I never heard of this? This set looks awesome! I have never heard of Spielgaben before but what an amazing product. So many options would keep kids busy for hours! I have heard of Spielgaben before! I’ve been drooling over out for a couple years. [email protected] making it rain! Never heard of it before, but it looks great. This has been on my homeschool wish list for months! I have seen this before and it was love at first sight! I had never heard of this before. Very excited to learn about it. I looked at this once before, but the price…we would love to have them! Yes, I’ve been dying to get one, but it’s sooo much money! This set looks like you could do a lot of different things with it. I liked the ability a child had in forming letters. It would be great to use at home. Congratulations on 10,000 facebook fans! I have also wanted a spielgaben for a very long time but we have never been able to afford it. Winning one would be a huge blessing to my family. I have 3 young boys (5, 4, and 2 years old) and we homeschool for many reasons. One is my amazing 4 year old with epilepsy. He would especially love this. Thank you for doing this giveaway and for your printables….we use a lot if them and they are fantastic! Yes. I’ve been drooling for about a year. Wish you could buy drawer by drawer! Yes, several years ago when there was a discount for ordering before it was released. At the bottom of the post, there is a link to another discount- if you don’t win, check it out! Good Luck! No I’ve never heard of it before, but they look awesome! I’ve heard of (and drooled over ?) Spielgaben – and I know my soon to be first grader would LOVE this kit! Ooooooo you had me at “let’s make it rain!” That’s exactly what my kids would do. Creative but messy. But what a lovely set!!!! I am so glad my kids aren’t the only ones!! Good Luck! I FIRST HEARD OF THESE A FEW YEARS AGO! WOULD LOVE TO OWN THIS SET! i haven’t heard of these til now, but wow, my type-a personality is drooling too! LOL this looks like such a fun, versatile, and long-lasting set of tools/toys for the classroom! The storage is seriously drool-worthy. They would be perfect for a classroom! I have wanted one of these sets a long while. Awesome giveaway!!! Never heard of spielgaben before, but looks awesome for sensory learners. I have never heard of this before – looks wonderful! That’s an amazing set. My kids like to be creative with hands, i love that it’s not connected electronically. Right? My kids have been having a ball with these, and I LOVE that it’s not a tech tool. It’s a tool that lasts for a lifetime of learning…we never stop. Love it! I’m in love with this set! I’ve wanted it for some time now. One of my children is extremely right brained, not to mention ALL BOY. He small has Sensory Processing Disorder. I constantly feel like I’m drowning when trying to teach him with average methods. Unfortunately, I’m not in a position to even save for this beautiful set. I’m so happy you and the kids are enjoying it so much, and that someone else will be equally as blessed! Doodle has sensory processing disorder also (on top of other issues)… this has been a game changer for him. Good luck! Never heard of this before, but love what I see so far!!! Wow, these look incredible! Never heard of them before…. I’ve heard of it and want one! I have never heard of this but it looks perfect! I’m somewhat familiar with this. However, I know them as Froebel gifts. What a beautiful set! I’ve been drooling over this for a few years and would love to own it! What an incredible giveaway! I’ve been drooling over this for over a year but just can’t find the room in my budget. Have not heard of this set but with two homeschooled littles it would be great to have. I saw a child working with this on another blog. It was wonderful that she could do a whole lot of different things with it. I didn’t have lots of money at the time and yet, I thought about buying it for the children that I work with. It is really a beautiful set, especially with the wooden box that holds all the parts. Thanks for sponsoring this giveaway. I’ve never heard of it but it looks amazing for kids and parents. I have never heard of Spielgaben before. I do plan on looking in to it more. I teach Pre-K so I think I would be able to use this in my classroom! Thank you for telling me about it! I have heard of Spielgaben. I have been very interested in it for the past few years. I am hoping to get one before my daughter is officially homeschool ready. I’ve never heard of it before. It looks very interesting!! Wow….I could see this doing wonders for my ASD kiddo who is very hands-on with learning and loves to build! This would be amazing for school, therapy and play! I have never heard of it before. It looks like an awesome resource. Beautiful, also! I have never heard of it but wow these look fun! I heard of them from another blog…I think…it may have been here, I follow several homeschooling Moms. They definitely look wonderful for hands on learning. I have heard of Spielgaben and have wanted one ever since I found out about this set. It is sooo awesome and would be wonderful to use with my kiddos. Sadly it is completely unaffordable. Winning this set would literally be a dream come true! It really is an awesome set! I have not heard of Spielgaben, but this set looks fantastic. I have not heard of this before now! I stumbled across these earlier this year and wish my hands-on almost kindergartener could play with them. I didn’t know about the activity books though! This looks amazing! My special needs son would love this! I will look into this! So excited to learn about Speilgaben. I had never heard of it before now. Yes, I’ve heard of it and wanted it for a couple of years but it’s been out of our price range. I’ve never heard of these but it looks WONDERFUL! I heard of it on another bloggers site. Looks amazing! I’ve not heard of it but it looks great. Thank you for the giveaway. Wow! I remember playing with snap cubes and things like that when I was going to school, but this looks like worlds more fun, and way more opportunities to integrate it into more and different activities. My six boys (12, 10, 4, 2, and 11-month-old twins) are/will be homeschooled, and this would be an amazing addition to our daily routine, especially since they’re all very hands-on learners. I haven’t heard of it before, but I’ve been searching for a kit like this for a few years. I have heard of it before and have had it on my wish list for a number of years!! I have never heard about it but from your blog it looks amazing!! Thank you for sharing! I have never heard of this set but it looks magical! I have a kindergartener this year too. This would be a wonderful addition to our curriculum. She suffers with speech difficulty and doesn’t like to talk because of it. I think I could get some conversation out of her with this! Never heard of then before, but they look awesome! Not heard of this before but this looks AMAZING! Simply wonderful. I have heard of Speilgaben, but wondered if the price was worth it. It seems to open ended, but have to save to make that kind of investment. It’s just not possible right now. I have been looking at this set for a couple years now, but just haven’t been able to purchase one yet. It really looks amazing! I have not heard of them before, but I love it! I have never heard of it before, but it looks like a wonderful set for learning. I had not heard of it before, but now I want to play with it! i HAVE NEVER SEEN THESE BEFORE, BUT i WOULD LOVE TO HAVE THEM! I have never heard of it but it looks great. I had heard the name, Spielgaben, but that is pretty much all I knew about it. It looks awesome! I’ve admired Spielgaben photos online for years, also! The loose parts concept reminds me of classic wood toys we played with when I was little. Thank you for the opportunity! Yes I have! But we do not have a set, and my kindergarten son would love it! I’ve heard of it but don’t know much about it. Looks amazing! I’ve never seen it before but it looks absolutely awesome! I’ve never heard of it before but it looks fantastic!! I have seen these sets on another homeschool blog. They look awesome!!! Yes, I’ve heard of them and would like to know more about how they work. I havnt heard of it before, but the concepts are familiar! Our home would love to have this! Thank you! No, but it looks amazing! I’ve always wanted a set! i HAVE SEEN THESE FOR A COUPLE OF YEARS AND WOULD LOVE TO HAVE A SET! IT LOOKS AWESOME! I have actually never heard of these sets before, but they look amazing!! I have never heard of it, but it looks wonderful!!! Yes, I have from another blogger… they look so neat! I have never heard of these but they look amazing. I have heard the name before. This looks amazing for homeschooling! This is something new to me, but it looks amazing! We have something similar to the geometric shapes, but this set is so much cooler! Yes! Spielgaben is a name I have heard many times in the Montessori blogs, etc I read. Lots of open ended, beautiful pieces! Would so love this beautiful set for our home. I have never seen these before! They’re so pretty though! I haven’t heard of these but it looks amazing! I would love to have one to see my kids explore, play, learn, and enjoy it. No I have not heard of these, look super cool though and great for for fun and learning!